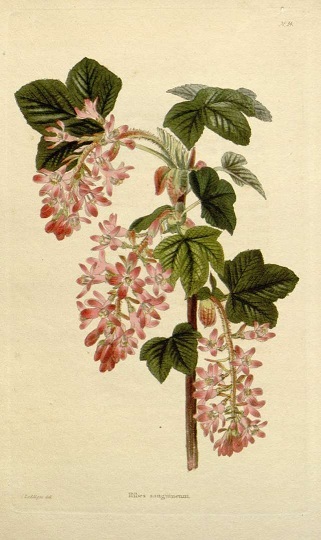 The many upright stems lack the sharp spines of other currants. 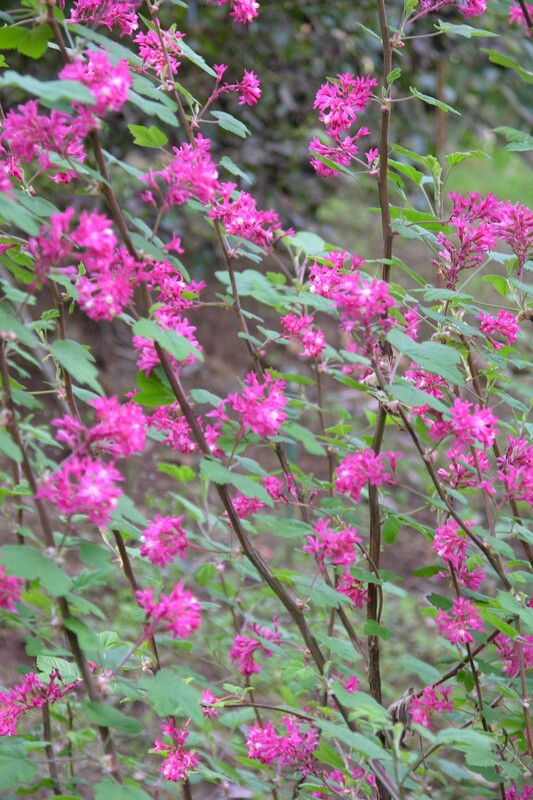 Gorgeous red to pink flowers bloom in spring before the leaves unfurl. 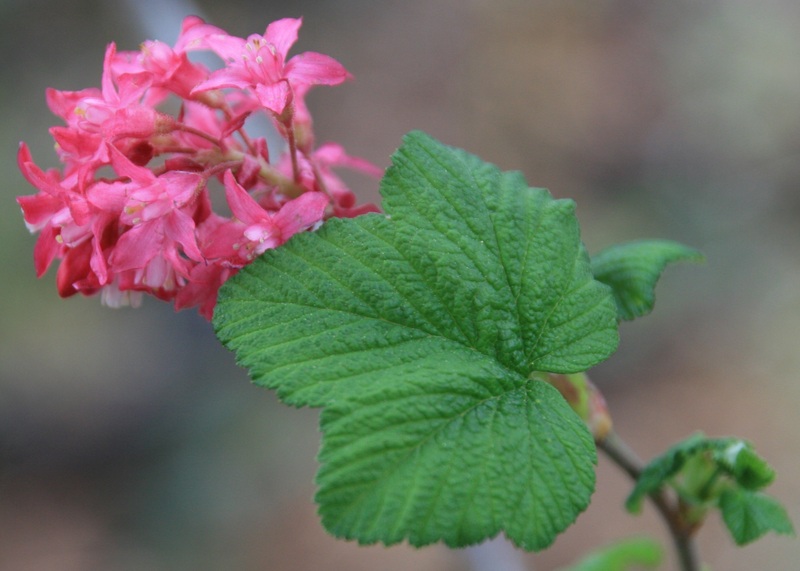 Hummingbirds flock to the flowers from their southern migrations. 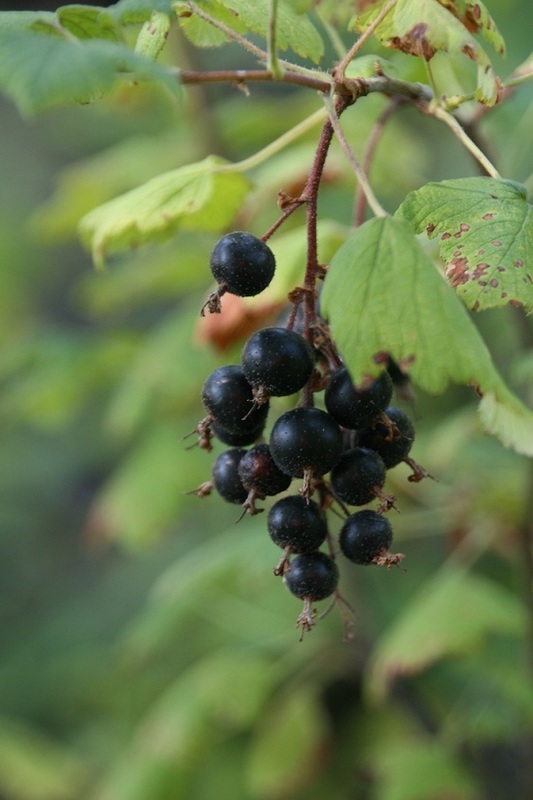 Black, glaucous fruits are edible but not tasty. 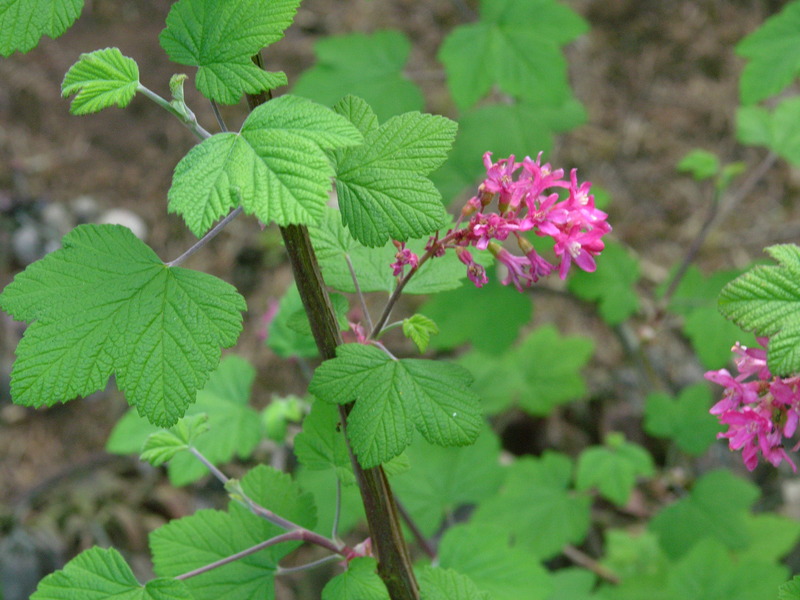 Native to the Pacific coast (USDA zones 6-10), Red-Flowering Currant prefers dry, sunny locations and is not hampered by drought. 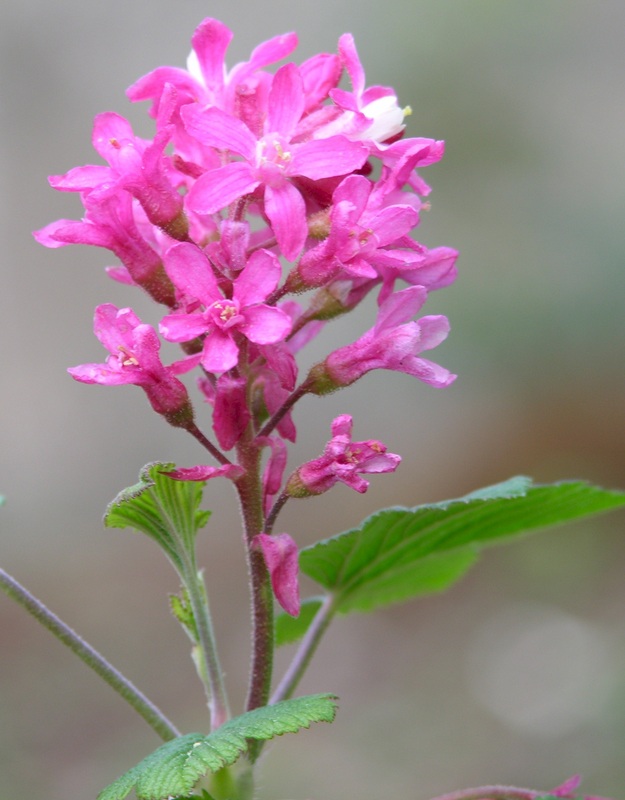 One of the best natives for your garden, it requires little care but is reliably beautiful. Highly recommended for any garden. 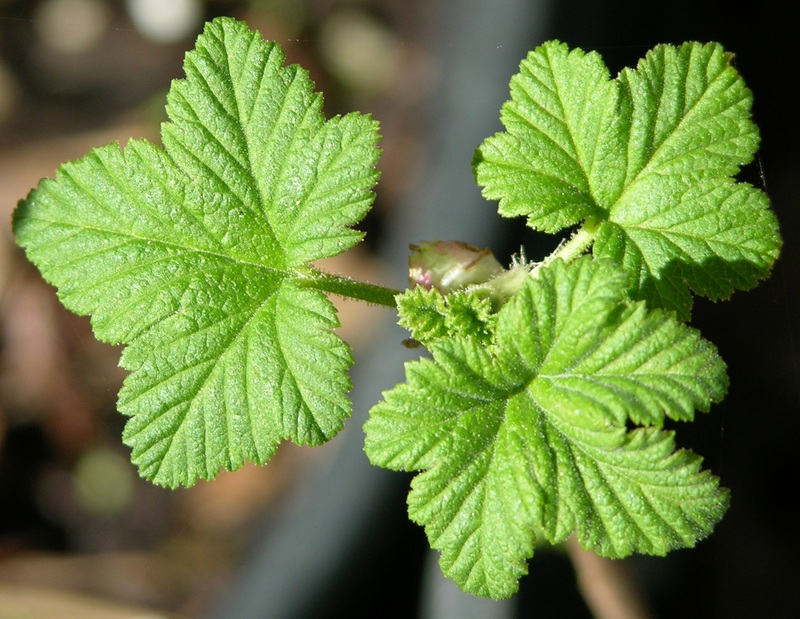 For a short comparison of northwest native currants, click here. 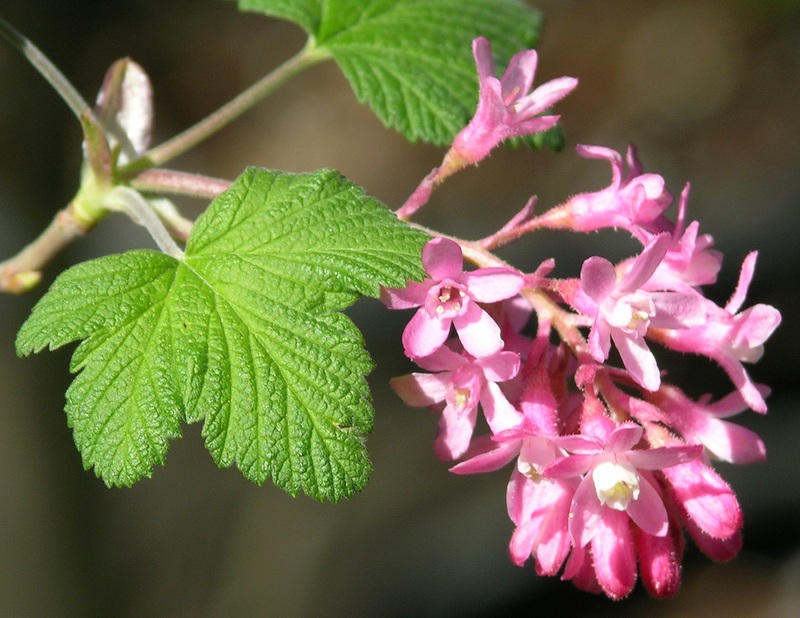 Red Flowering Currant (Ribes sanguineum) is a magnet for butterflies and hummers. 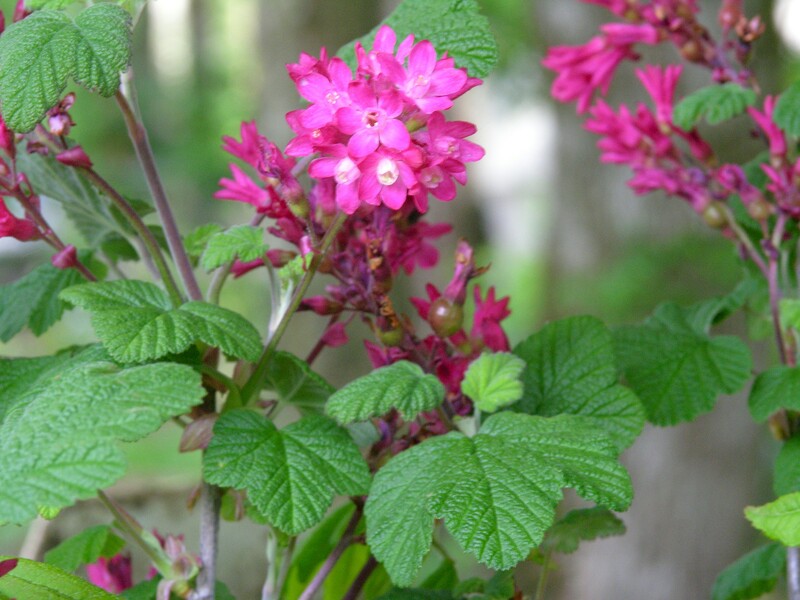 In the garden, it grows 8-10 feet and thrives in sun to partial shade. 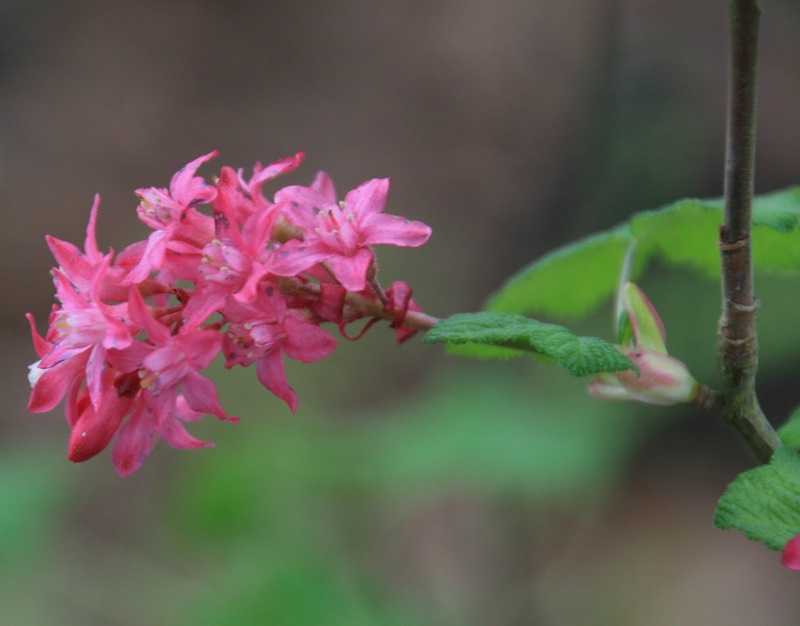 Requiring little care, this native gives both beautiful flowers and black fruit--both in high demand by your favorite hummingbirds. 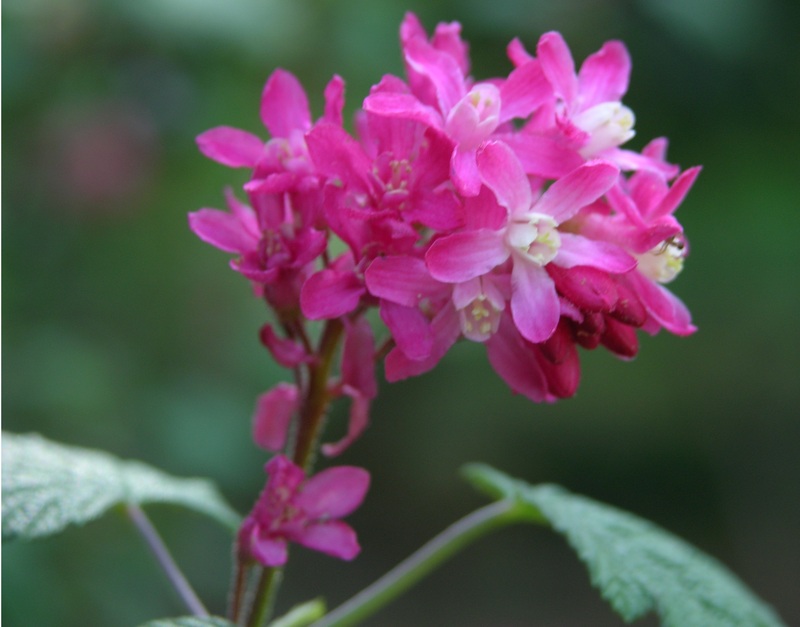 A must for the butterfly garden. 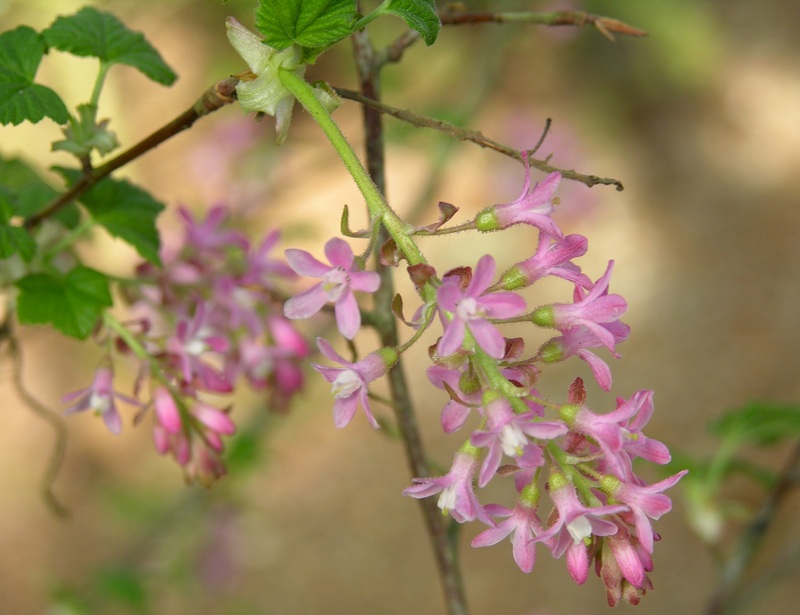 Cut blooming branches for bouquets in April to June. 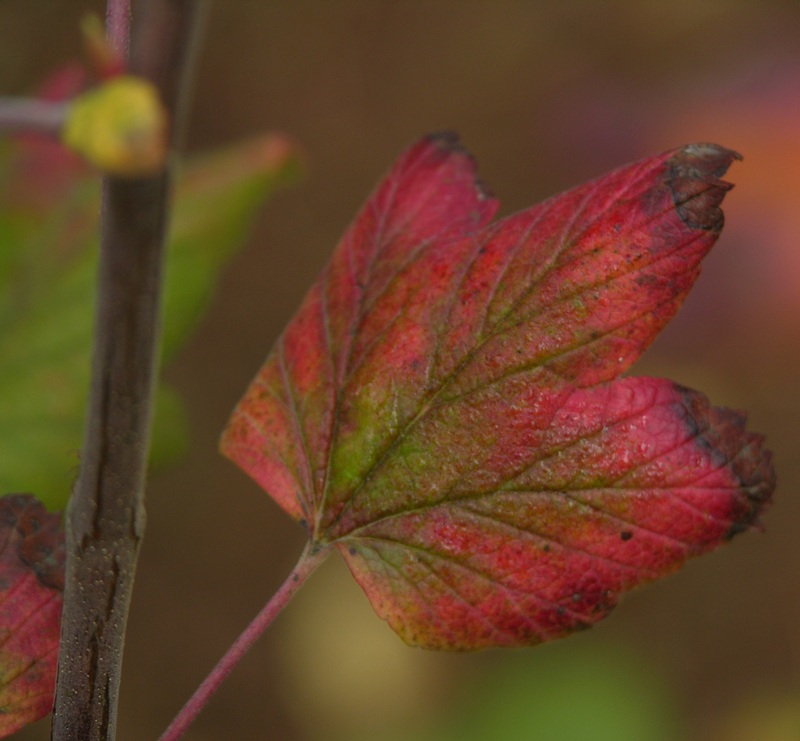 Leaves are small enough that they can lie where they fall in the autumn, making mulch for neighbor plants. 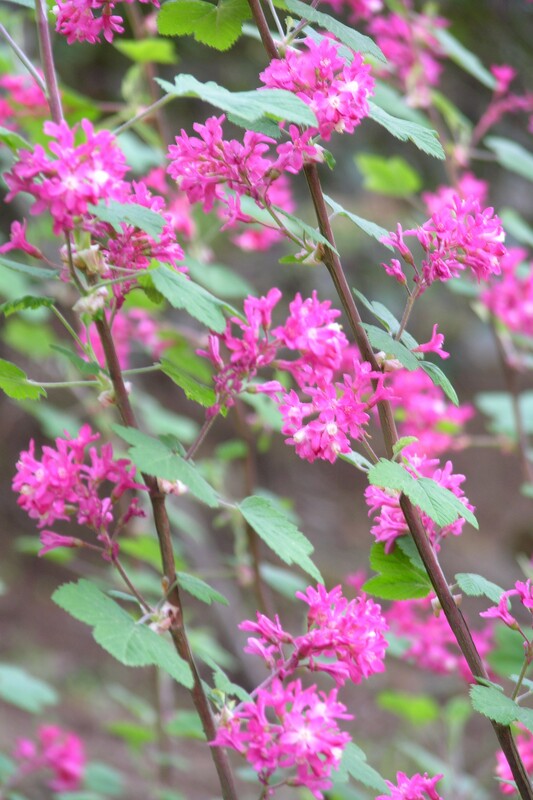 Originating right here in the northwest, this shrub was introduced to gardeners on the continent by David Douglas, a prominent plant hunter. 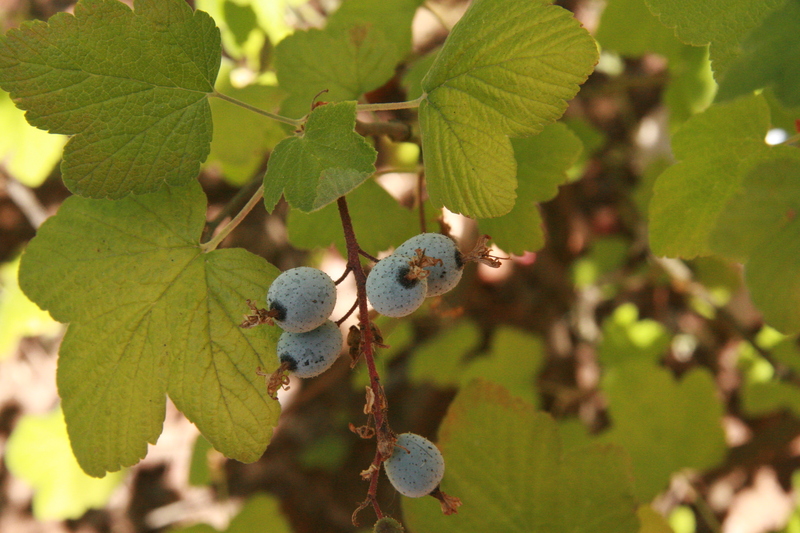 Although this plant does fruit, the berries are not actually tasty. Coast Salish groups ate them fresh but they were not well-enough regarded to dry for winter fare. However, birds find them quite tasty. 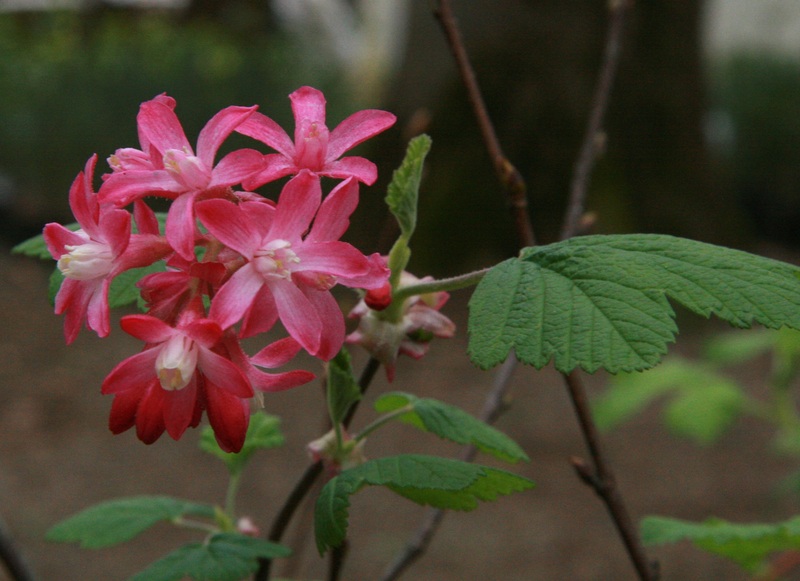 On occasion, some specimens will have white blooms but this is not a very common occurrence. Combine this shrub with Oregon's State Flower, the Tall Oregon Grape (Mahonia aquifolium) for a brightly colored garden focus. The bright yellow grape bloom and reddish currant flowers are striking together. 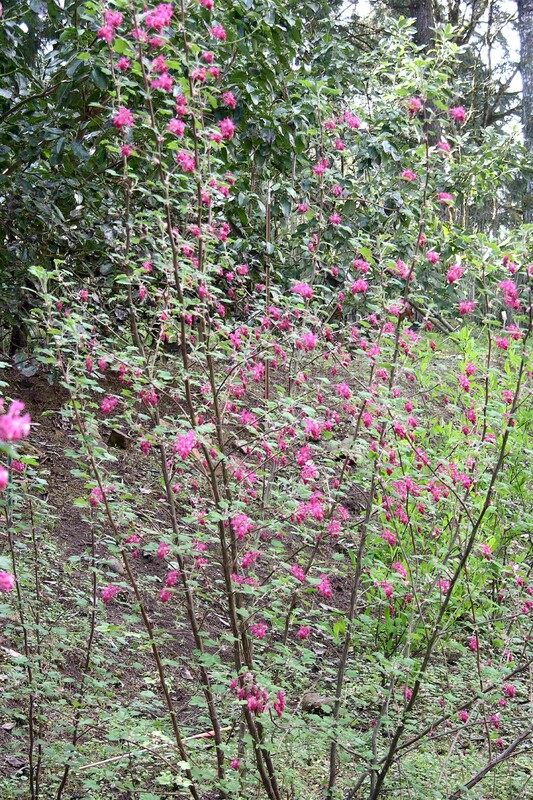 You may prefer a grouping with all-pinkish flowers. 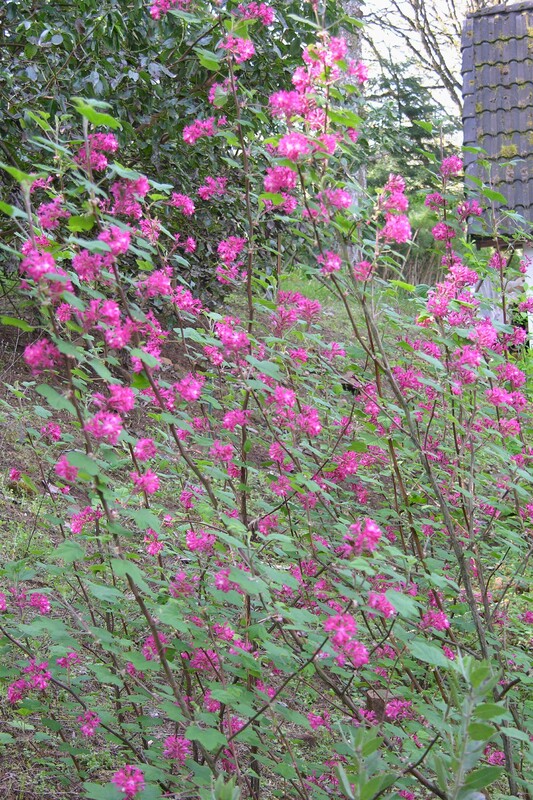 Underplant your current with Wood's Rose (Rosa woodsii). 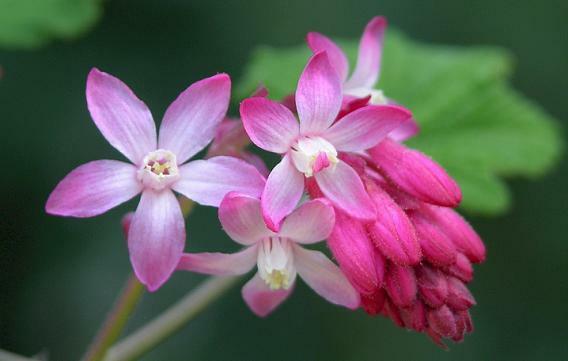 A whimsical combination of Pink Honeysuckle (Lonicera hispidula) is charming and the currant provides a living trellis for the honeysuckle. 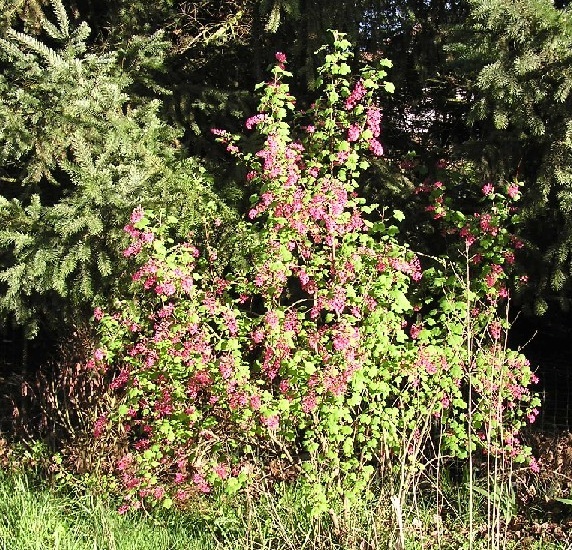 You can occasionally find these plants in bare root form this time of year. 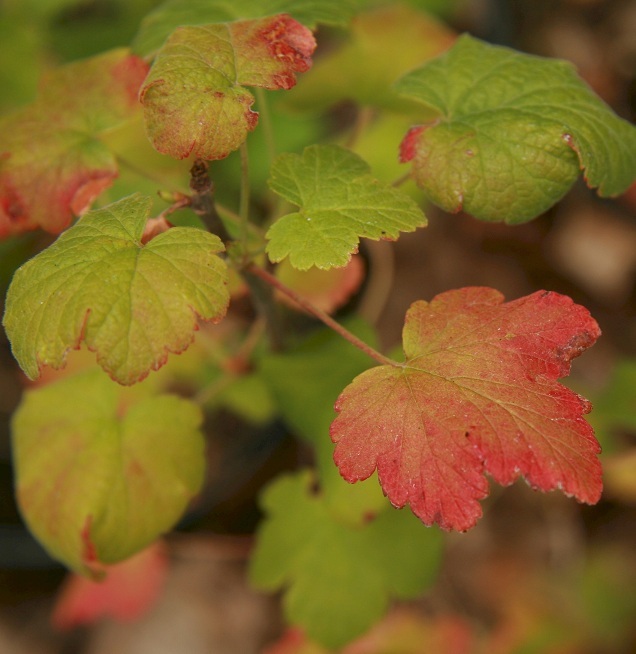 Another native of the Pacific northwest, evergreen Oregon Boxwood (Paxistima myrsinites) is excellent as a lower story for currant and the tiny red flowers look more prominent when paired with the Red Flowering Currant. 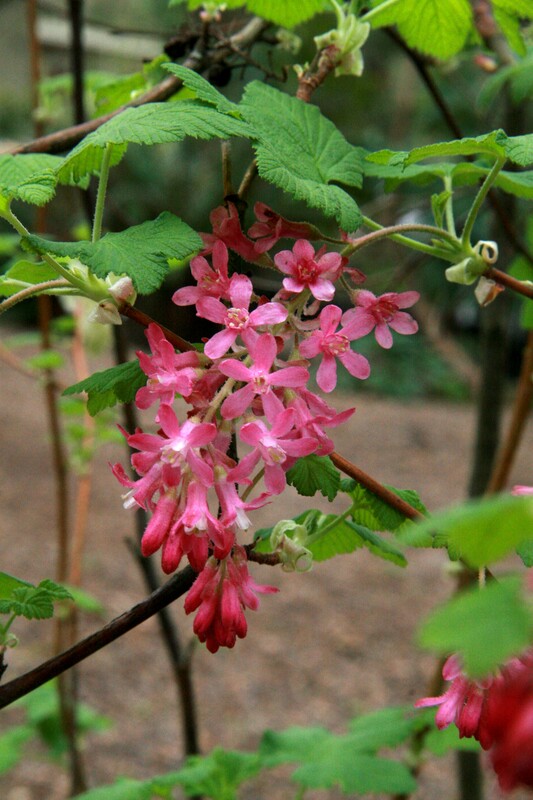 "Just outside my office door at the nursery and gardens are pots of Red-Flowering Currant (Ribes Sanguineum), one of our northwest native flowering shrubs or small trees. 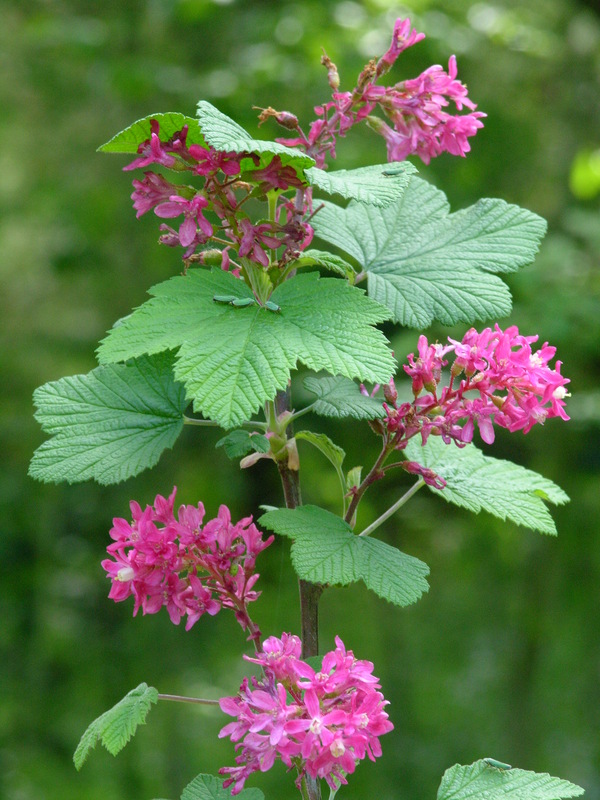 The soft look of the vibrant pink bloom clusters contrasts beautifully with the ridged texture of the light green leaves. 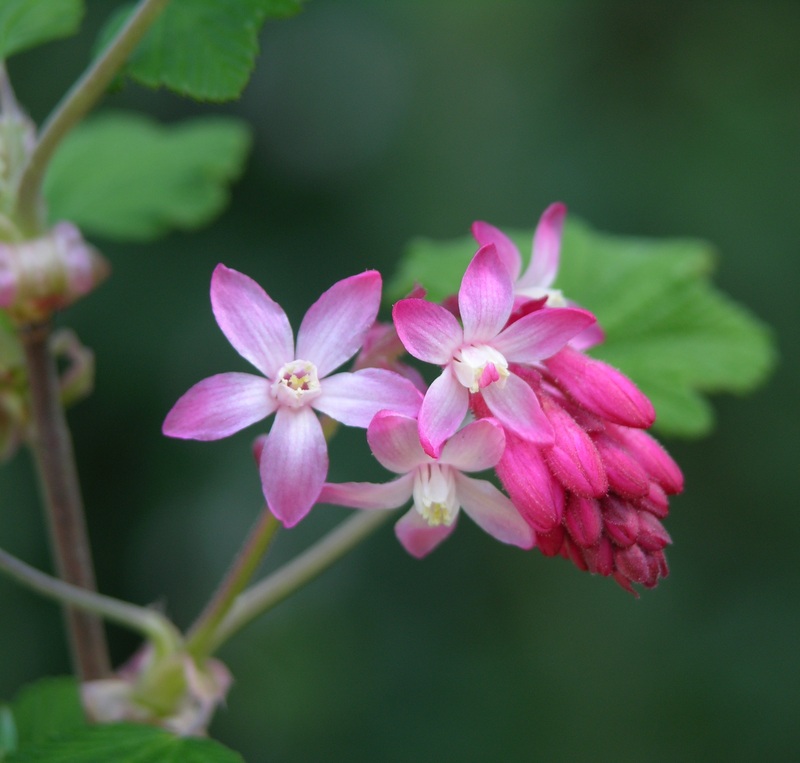 The early settlers often moved plants from wilderness areas to their homesteads so they could enjoy the fresh beauty of their springtime blooms. Imagine their delight when those flowers are replaced by berries nourishing not only to people but to birds and other wildlife! 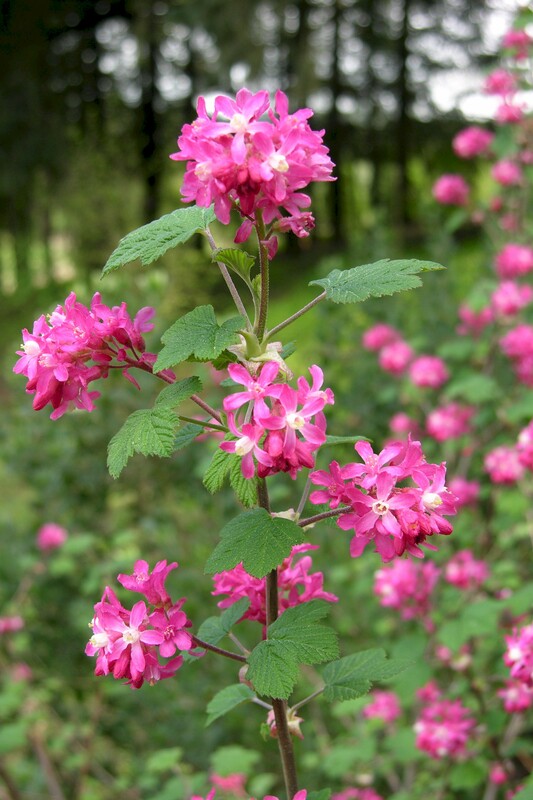 If you look at the shrubs around homes built in the early 1900's, you'll usually find the Red-Flowering Currant a prominent member of the landscape." 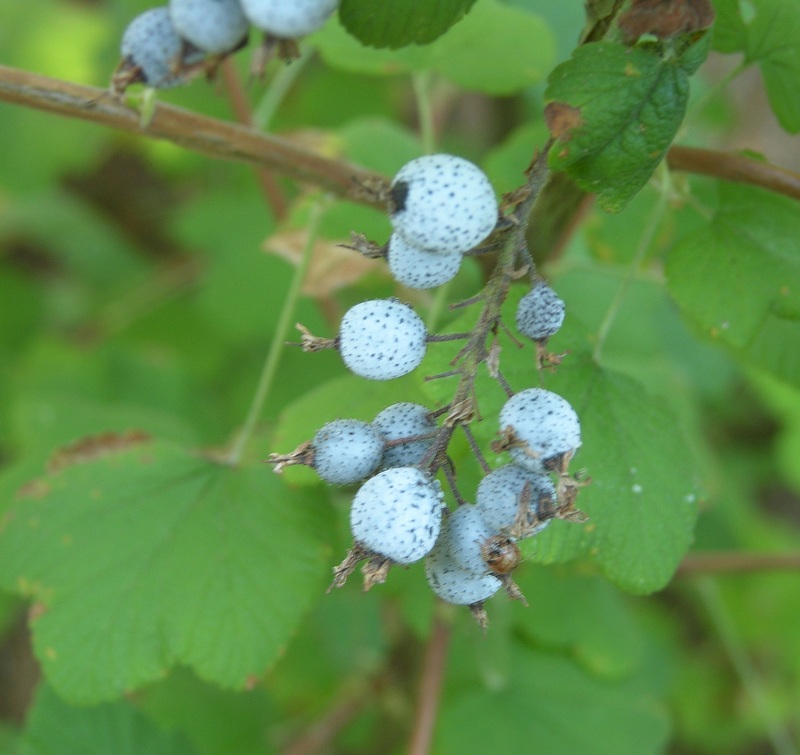 Each year in August when the Red-Flowering Currant blooms have gone by, the stems of this deciduous northwest native shrub are graced by fruit of an unexpected blue. They're not quite a robin's egg color though they are speckled. 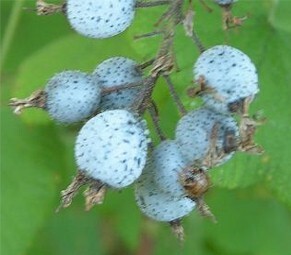 They are more of a sky blue with dark blue dots. 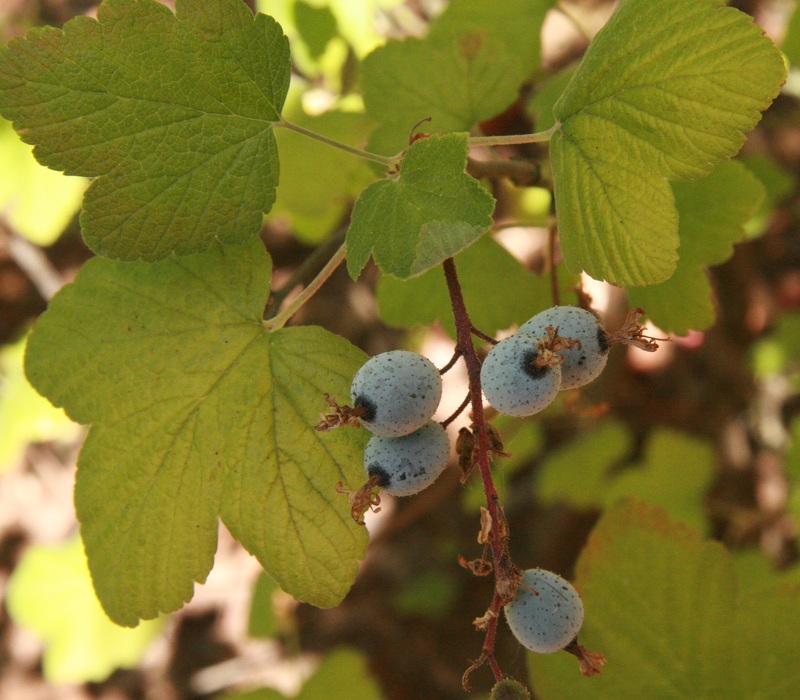 As most gardeners are all too aware, true blue is a hard color to come by in the garden. 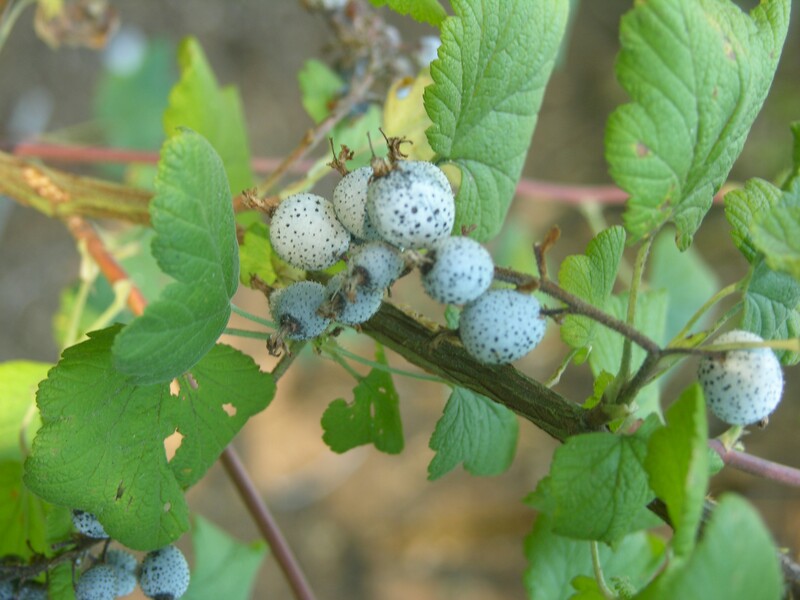 Blueblossom (Ceanothus thrysiflorus) comes to mind when we think of azure tones, and the old standby, Oregon Grape (Mahonia), has dark blue fruits. But the cerulean spectrum lacks sources of representation. That's why it's such a pleasant surprise in August to find our friend who sported those lovely carmine red to hot pink flowers May through June has changed it's color scheme for cool blue! 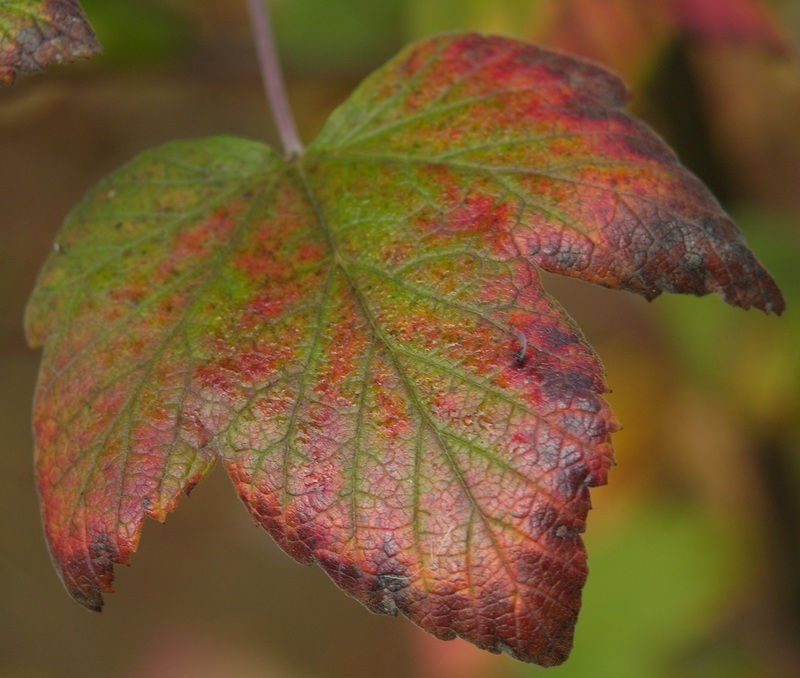 But that's not all: after the fruit has been stolen by furred and winged wildlife the leaves won't quit the plant until they've changed their green to shades of red, orange and gold. 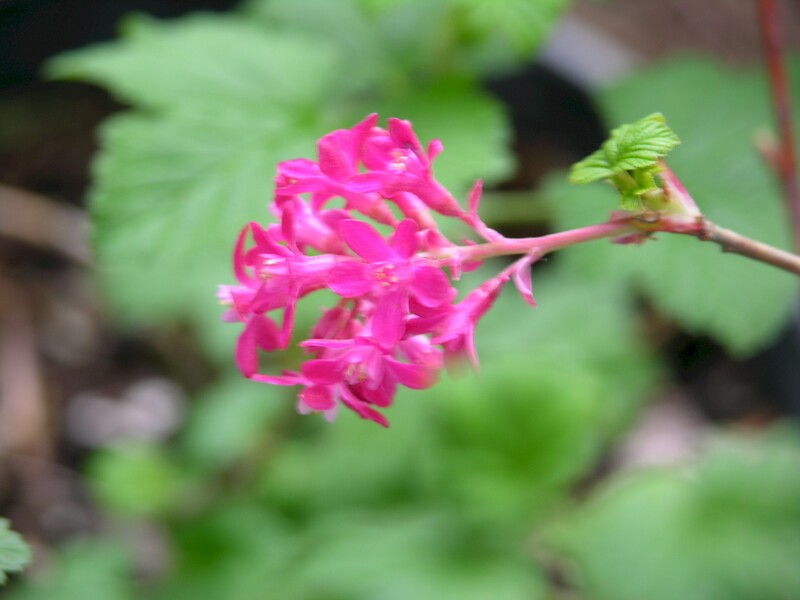 Somehow we forget about Ribes sanguineum when it's bare and dormant in the winter. We are full of hurrahs for those longed for spring show-offs, Trillium and Fawn Lily (Erythronium). 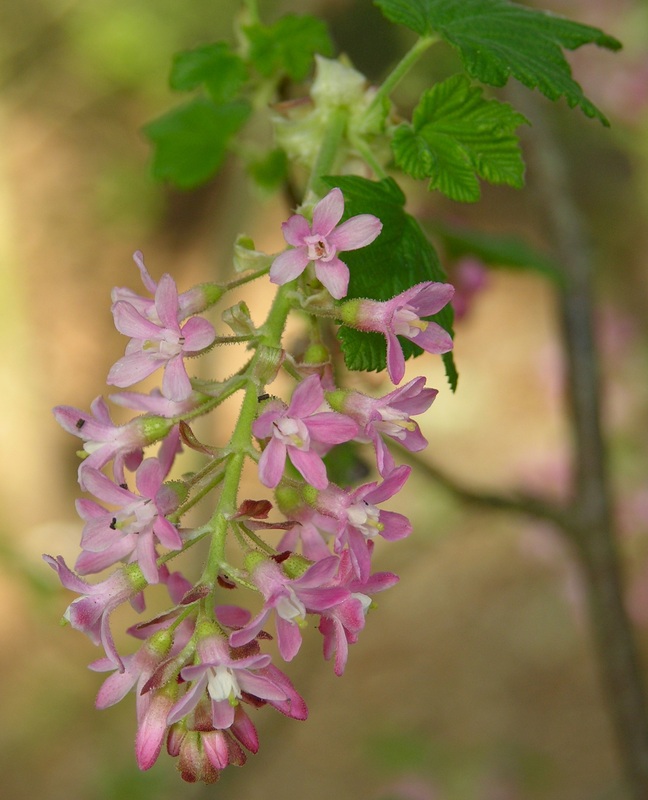 We wax poetic for Indian Plum (Oemleria cerasiformis) and Western Redbud (Cercis occidentalis). 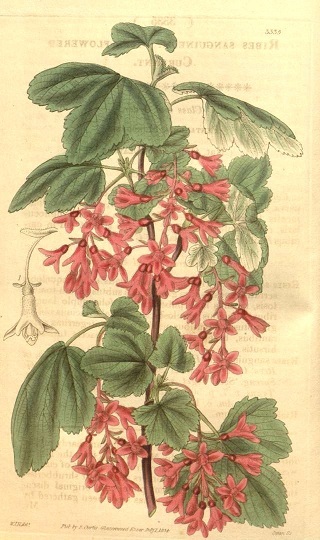 Until one bright day in May we notice our currant has become the queen of the garden. And we say, "Oh, hello, my dear--what kept you so long?" 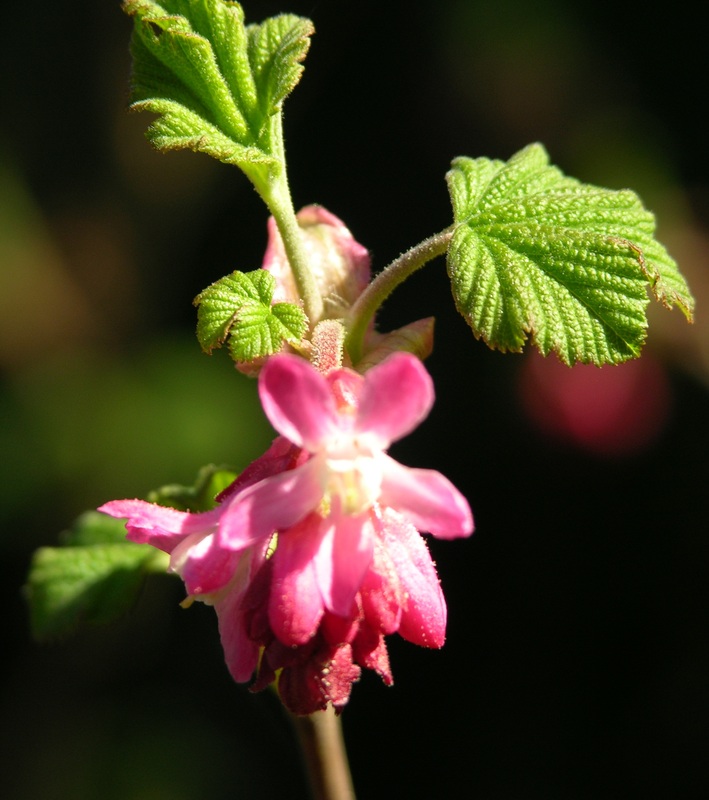 Consider a Red-Flowering Currant for your garden this year. You may find it to be one of your best friends.